Happy Wedding Wednesday, everybody! *GIVEAWAY ALERT* Keep reading to find out! Now that my guests have had plenty of time to receive their save the date's from us, I've decided to share this very special creation with you. Save the dates have a very unfortunate acronym so I'm going to keep spelling out 'save the date' for you. ;) Typically, you'll see save the date cards with photos of couples on them. In my line of work, I often feel that my family and friends get sick of seeing pictures of me- because I certainly get sick of looking at myself! I also knew I wouldn't be able to commit to one picture of us to live on someone's fridge for 6 months! Therefore, I was inspired to shake things up a bit with our save the date's. Cue Brittany Branson. I came across Brittany's Instagram in the fall and I was immediately attracted to her bubbly personality and stunning designs. 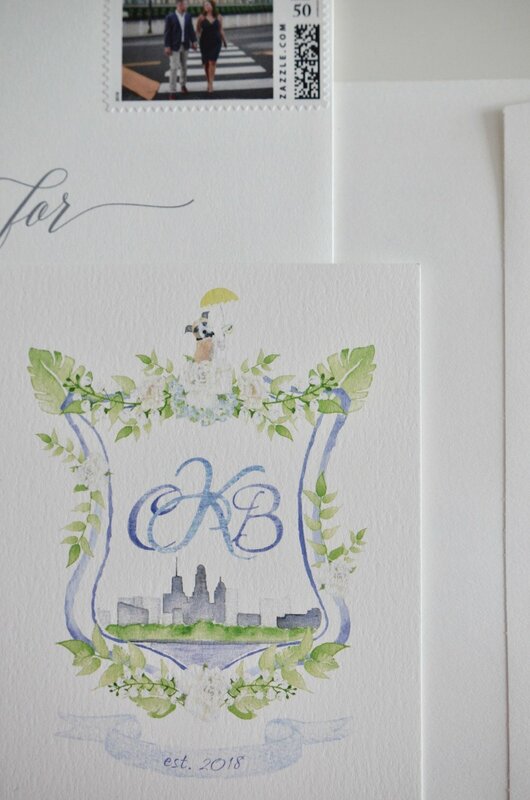 My wedding planner, Karina Lopez connected the two of us and decided to create a custom wedding crest, also known as a watercolor heirloom crest. Brittany thrives o working with couples who aren't afraid to get creative! In that, she loves using their love story or unique aspects of their personality as her inspiration for creating their custom wedding art. After some careful thought and research, Brian and I pulled together all of the things that embodied our relationship. These ideas were then sent over to Brittany and we gave her creative reign to make something special. And boy, did she deliver! -Walter, our dog, in a bowtie // we wanted him represented in a way that wasn't overkill, I think she did so well with this concept! -Established in 2018 // for the obvious reason of getting married in June 2018! It's simple, thoughtful and yet so meaningful to Brian and I. I know we'll be able to use this crest for years to come. Spoiler alert: I believe we're going to use the crest on our custom stamps for our formal wedding invitations. We also can add it to little details at our wedding as well as frame it in our home for years to come. We had the crest implemented into a simple design on Minted and printed it on a thick card stock through them! Giveaway will run Wednesday, March 14th at 12:00pm EST until Saturday, March 17th at 12:00pm EST. Must be following both of us to enter, subscribed to my website and commented on my photo. No purchase necessary! Winner will be chosen by a random name generator. What do you think of my crest/ save the date?! Leave your reply below. 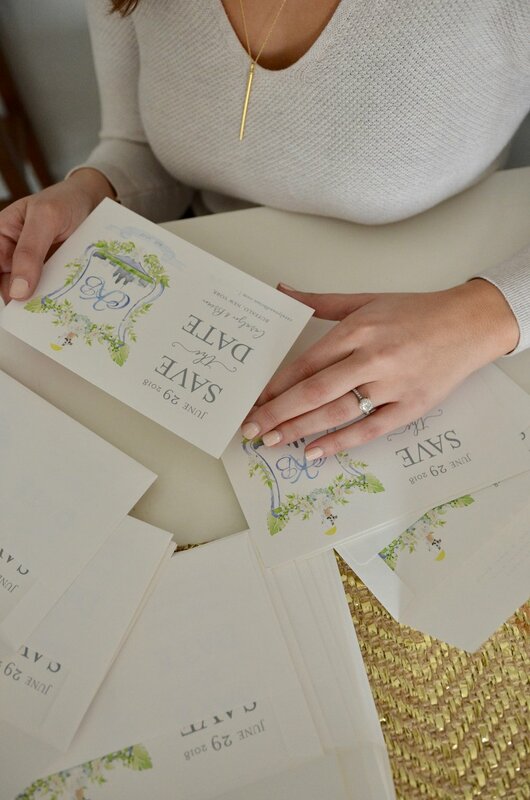 Special thank you to Brittany Branson and Minted for collaborating with me on this post!